These tacos are the best ground turkey tacos around. 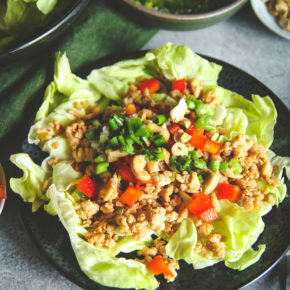 They come together in a flash and then are slow cooked to perfection, and the recipe comes from one of my new favorite cookbooks – Skinnytaste Fast and Slow: Knockout Quick-Fix and Slow Cooker Recipes. 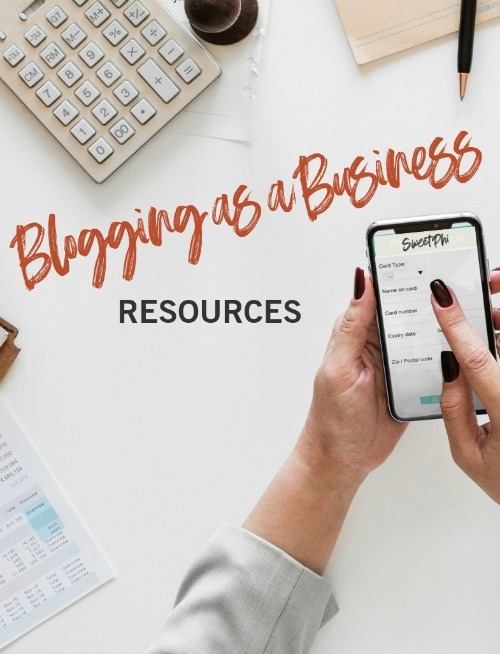 I then started following Gina’s blog, Skinnytaste.com. I made her recipes, and they always turned out great. Then in April I had the pleasure of meeting Gina face to face at a retreat. The thing you have to realize about Gina is that she is wildly successful. She’s big time. 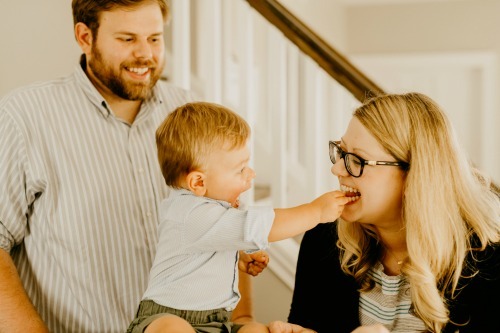 Her blog is incredible and her first cookbook is a New York Times best seller!! When I met her in person, I was blown away. She radiates kindness. She is the nicest, most down to earth, most deserving of every success in the world person. She is amazing. When my cookbook came out over the summer, she was one of the first ones to share a recipe (she posted five-ingredient chocolate cheesecake cups), again, I was blown away by her. 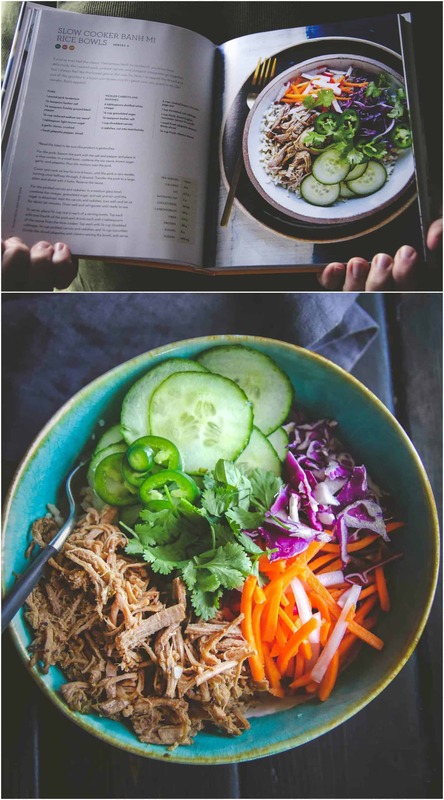 And now her new cookbook Skinnytaste Fast and Slow is out, and I have to tell you, yet again I am blow away, I am truly impressed. Every page is packed full of useful information, and the recipes are nothing short of amazing. There are 140 of them, and I cannot wait to make them all (no joke). I’ve already made several, each declared a favorite in our household, each has been requested for repeat by my husband. 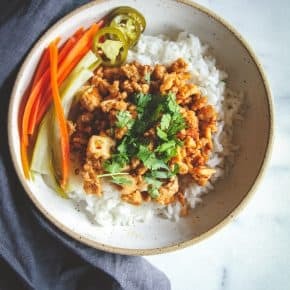 I’ve made the slow cooker banh mi rice bowls (so good) and the slow cooker chicken burrito bowls (again, so good) and Madison’s favorite beef tacos (yet again amazing). 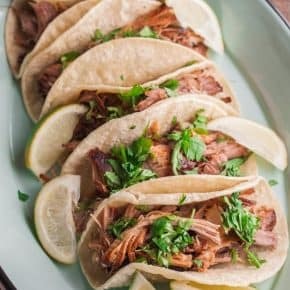 Today I’m going to share with you my take on Madison’s favorite beef tacos by making them with turkey, and instead of making them in a slow cooker (mine is in storage because we are in the process of trying to sell our house) I made them by slowly roasting them in the oven. 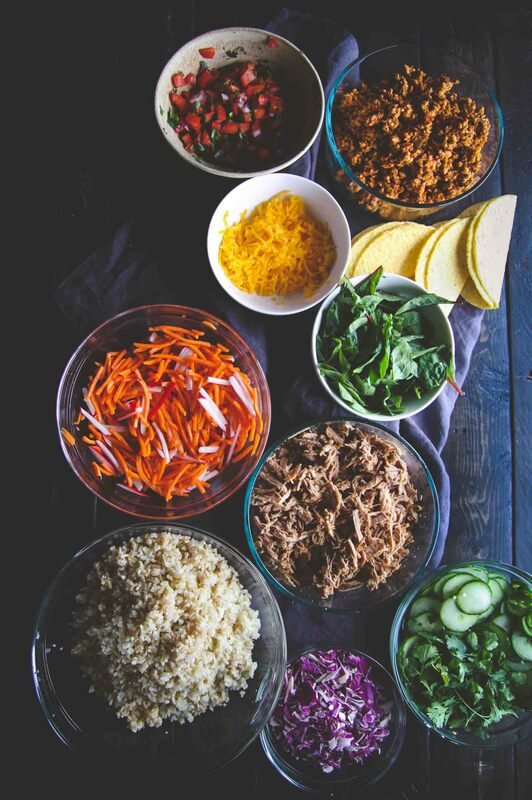 These tacos – as with the other recipes, were perfect for meal prepping/planning. 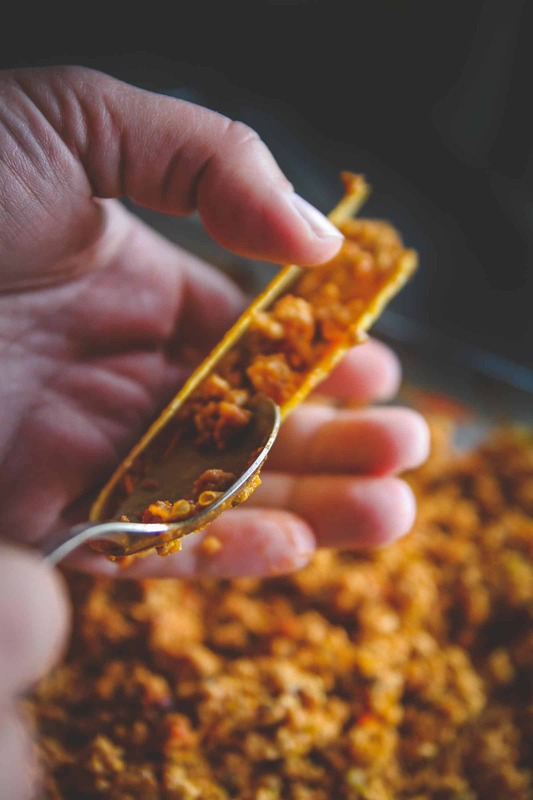 When I made these turkey tacos, they were seriously the best ground turkey tacos I have ever had. 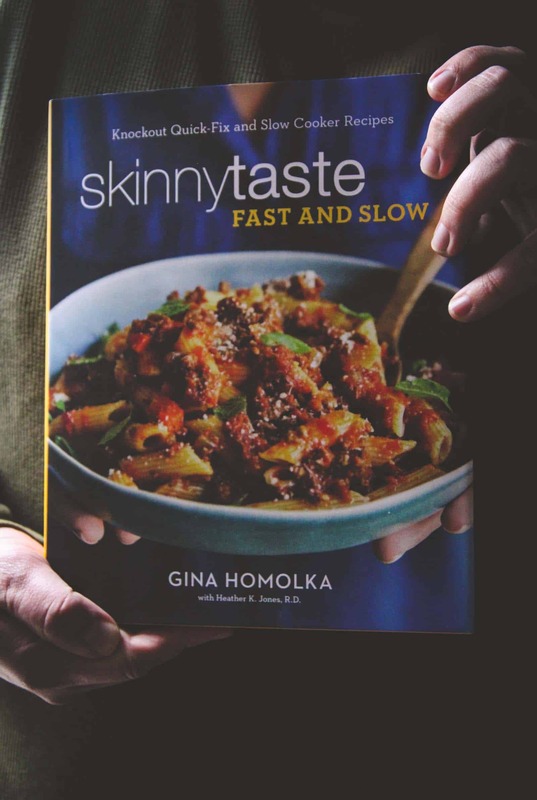 I know you’re going to love them, just as I know you’re going to LOVE Gina’s new cookbook Skinnytaste Fast and Slow: Knockout Quick-Fix and Slow Cooker Recipes which is available via Amazon, Target, Barnes & Noble and Indiebound. In a large nonstick skillet, cook the turkey in the olive oil over high heat, breaking it into smaller pieces as it cooks. When no longer pink add 2 teaspoons of the cumin along with the remaining dry spices, onion, bell pepper and garlic, stir and cook 2 to 3 minutes until soft, then transfer to either a slow cooker or baking dish, along with 1/2 cup water and tomato sauce. Slow cooker method: Cover and cook on high 3 hours or low 6 to 8. Discard the bay leaf and add the remaining teaspoon of cumin. Oven method: Cover baking dish with aluminum foil and cook at 250 degrees for 2 hours. Make the pico by combining the tomato, onion, fresh cilantro, lime juice and salt in a bowl, stir. Heat the taco shells according to the directions, then assemble placing 1/4 cup turkey in each shell, topped with lettuce, 1 tablespoon cheese and pico. 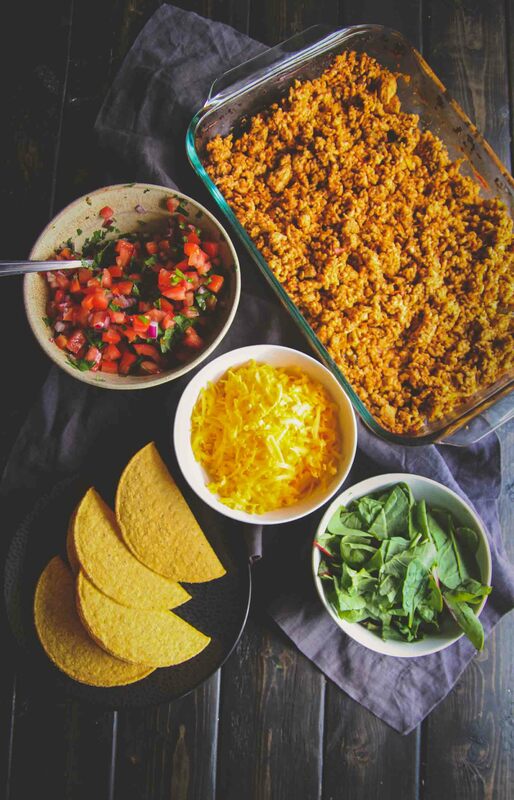 This recipe makes enough taco filling for multiple meals. Refrigerate the leftovers in an airtight container for up to 4 days or freeze for another night. I do love Skinnytaste – I have the first cookbook! These tacos look delicious!!! hey girl this is my kind of food! Yummy! Thank you so much, these turkey tacos were phenomenal! All my favorite people released cookbooks this year (INCLUDING YOU). These tacos look FAB. Your photos are beautiful, Phi! We’re just wanting to move a little closer to my work – I work out in Delafield and my commute from Milwaukee is just crazy every day (I’m in the car over an hour and a half ever day). But I love the Milwaukee area too much to move away lol. Sounds like an amazing taco Phi, will check out her blog too. Thanks! Hey beautiful lady, your turkey tacos look like such a great recipe and also the skinnytaste fast and slow cookbook looks awesome. Hi Phi! 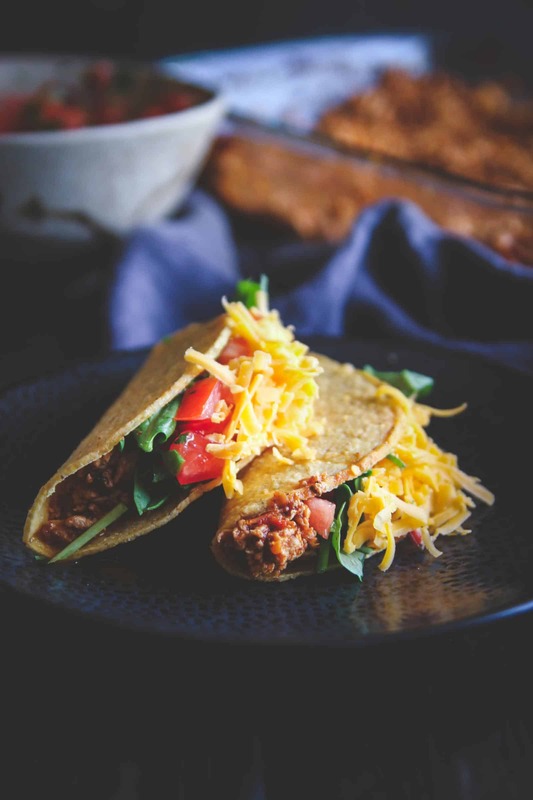 These tacos look delicious and are perfect for a healthy snack. We will certainly give them a try, we’d only substitute the chili with smoked paprika, as I (Mirella) had some issues (we wrote you about in an email before),so hot spices are out of the question unfortunately. Excellent recipe, we both LOVED it! Hi Panos and Mirella, so glad you like the looks of these tacos, they were so delicious, and I think that paprika would be a great substitute! Hey, dumb question, but do you have two kinds of turkey in the picture? Is one shredded and the other ground? Yum, that recipe looks great too! Maybe we will do both for our next margarita night! I am new to your page, thanks for the response.